I first heard of Moalboal about three years ago from my cousin Sheila from Deutschland who’s visiting us for a holiday, I remembered asking her it’s location. I learned then, that it’s a remote place in southwest Cebu and best known by divers. I was thinking it would be a good destination for fun dives and even for just a get away. So, Angel and I included this in our dive trip plans as part of Tubbattaha 2010 preparation. I never got the chance to explore Cebu’s countryside, with all my trips were at the city either attending conferences, meetings, conventions, get away or as stop over to other cities in the Visayas. We went straight to south bus terminal and got into a Bato – Barili Ceres bus, the summer heat beating and it was too hot and it seemed like forever before it finally left the terminal. Last month, I went south of Cebu passing the towns of Minglanilla, Naga, San Fernando but this time upon reaching Carcar, the bus went west to the mountainous side to the towns of Barili, Dumanjug, Ronda, Alcantara and finally Moalboal. I thought there’s no need to tell about my trip to friends back home but my friend Agnes surprisingly called up and after few plesantries she was aking where am I and who am I with! Arrrrgh…. I wanted to end the call immediately. 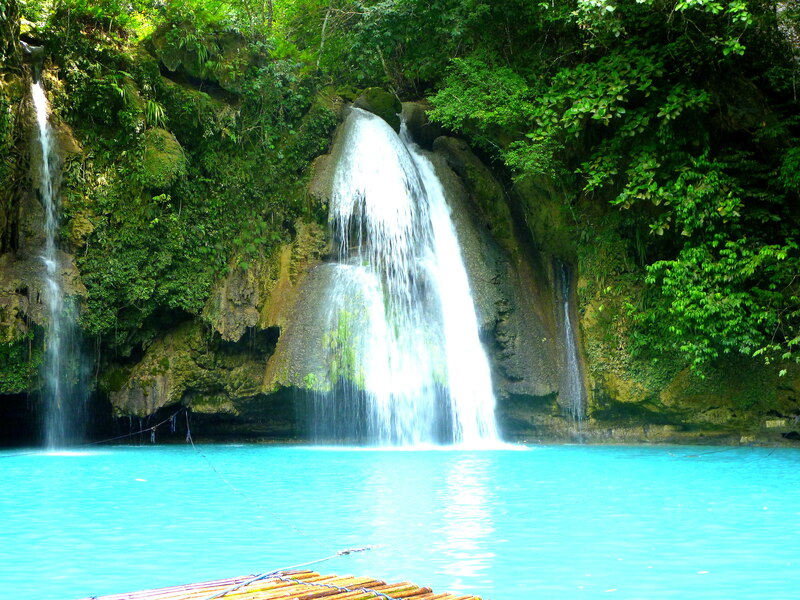 Next town is Badian, a secret get away too with a beautiful island, which is home of the opulent Badian Island Resort & Spa, and the famous Kawasan Falls – a falls I heard long, long time ago and wanted to visit. While we still have the afternoon free, we planned to have a side trip to make most of our time. The tricycle was waiting for us when we got back to the lodge – the summer heat got us so we need the cool waters to refresh us. It was about 24 kms. to the site, it was a long trip with the tricycle. There was a church at the entrance of the park, and the trek along the river took us about 25 minutes until the falls and pool. Just seeing the falls and hearing its gushing waters was so tempting – so cool! The guides told us it’s an advantage not to go there on weekends, because there would so much crowds, much noise and one can’t fully experience the nature’s beauty and serenity. True enough – lesser people, less queue for the bamboo raft, less noise thus with great pleasure. We finally get into our raft after some waiting, I was thrilled getting near and under the falls – the waters was cold & strong! It was just what we need to cool down from the summer heat (no, not summer anymore!). And we went inside a crevice just enough for the raft to pass through and we need to lie flat – something rare! Just like kids we soaked ourselves, played with the waters and enjoyed so much the free massage from the falls! Looc, Pescador Island, Kasai Point and some Surprise! We wake up early as our first dive is at 7:30am, and we need to be there earlier. The weather was bit downcast and I consider it better so there won’t be too much heat. There were other divers too mostly foreigners. I tried to watch closely the crew assembling the gears at the back shop. We were assigned to Yosil as our DM who I learned later to be one of the most keen divers especially on micros, and very efficient on buoyancy control. We cruise for about 15 minutes to our first site at Looc which is across a sandy white beach. We descend on a drop off wall – good sightings especially the big green turtle perched on a hard coral with two fishes on its back. I tried to catch the attention of Angel & Mike so as not to miss it! Then after about 30 seconds, it swam away – so schon! There were gorgonians in different colors as well as star feathers, I tried to look closely for crinoids but none or maybe my eyes failed me. 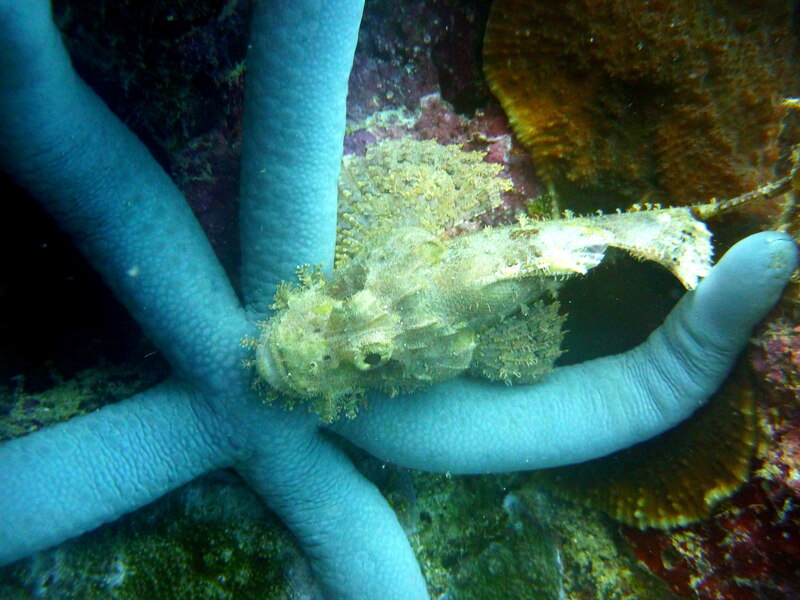 There were groupers, batfish, butterfly fish, colorful nudi branches among others. We do some bit of clean up – found plastics in corals. I sighted about 2 fish cages, one of those things I don’t like to see underwater – an insult to the marine wildlife. Can we just leave them alone? We are only there to enjoy the sites not to harm them! 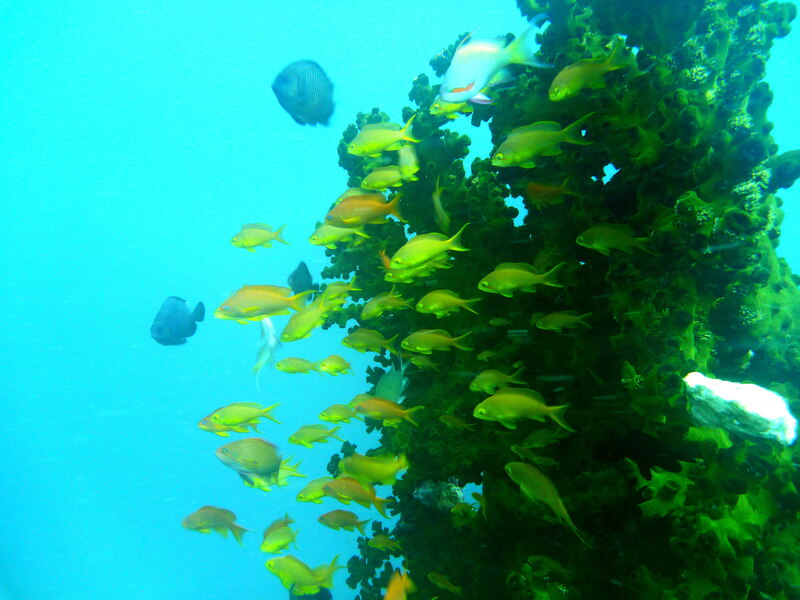 We had our safety stop in a white sandy area with full of soft & hard corals, colorful sponges and juvenile fishes. Angel and I explored the area – found a pipefish which just stayed near and was fascinated with the flounder. We hardly noticed it as it was of same color with the sand. We surfaced after 45 minutes with my air at 40 bars. After our quick breakfast (cappuccino and local breads) at the lodge we get back to the diveshop for our next descent. We’re bit excited since we’ll be exploring Pescador Island but I told DM Ms Lindy to get away with the current. J She said we’ll be going north, then east and swim back where the boat will wait for us. She warned us not to go deeper 20 meters. We were the last group to descend – each in different spots. 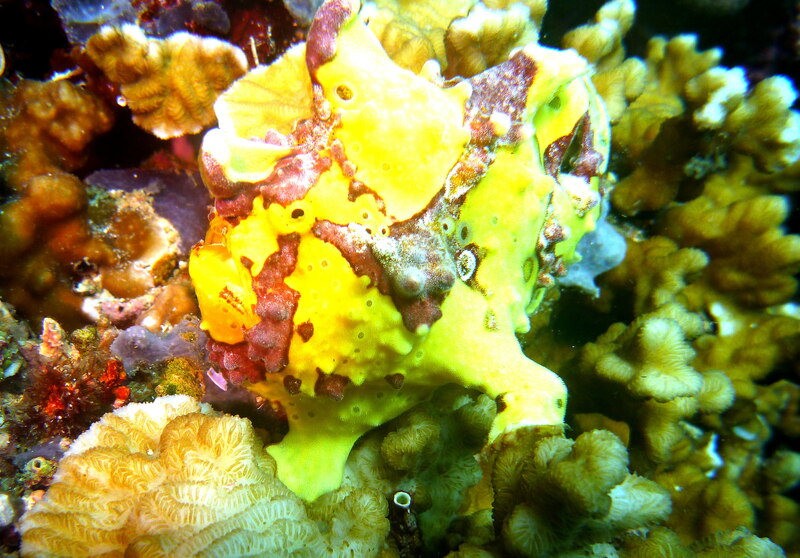 We swam into a drop-off wall covered with colorful corals, sponges and feather stars. Then the large thick school of tamban (sardines) – millions of them, we watched it in awe, my first time for such sightings. I guess fishing them all won’t fit in the dive boat. 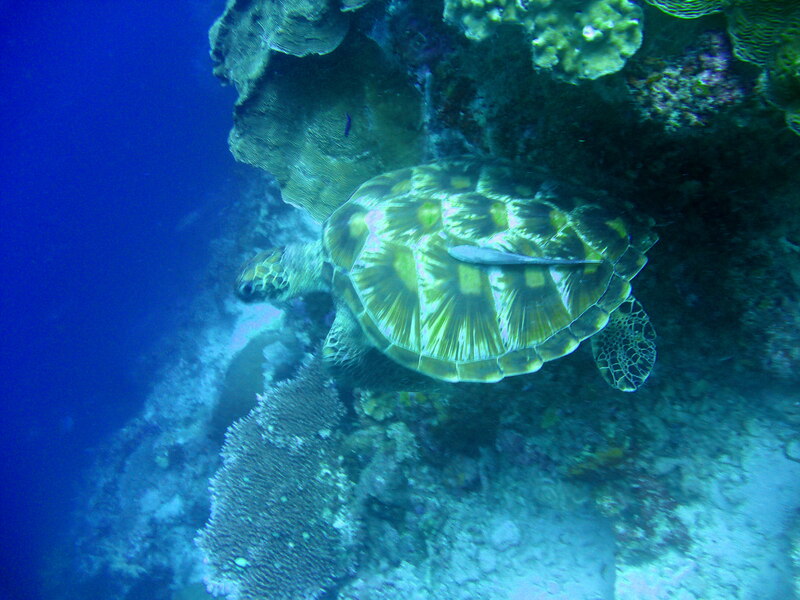 We saw sea turtle again (smaller one), few tuna, a frogfish in camouflage, pipefish, sea cucumber among others. We found again at least four plastics in the corals which were taken away by the DMs. We went again to a sandy area for our safety stop exploring around. Ms Lindy pointed out to us a blenny which seemed to be tamed – it didn’t swam away. We surfaced after 46 minutes just in time when Angel’s air gone zero! He shared Larry’s (another DM with us) octopus for the ascent. We cruised back to Panagsama for our lunch break, we ended at the far end of the street in a secluded restaurant but overlooking the waters. We got back to the lodge for some power nap as our last descent would still be at 2:30pm. Torsten was there like a gracious host asking about our dives and telling us stories of his own dive experiences in the area. After a coffee break, settling bills, brief talk with Ms Lindy and goodbyes, we went off to the lodge – it was such a full day. It was great advantage to have a nearby accommodation. I needed some time in the bath to wash off all the salt especially my hair. Mary Ann informed me that Torsten is inviting us for dinner with no reason. But when he arrived, he said he’s preparing a small dinner because one of us is the 100th guest of the lodge! Surprises of all surprise – a sumptuous dinner plus to be featured in news on their website! 😛 Angel & Mike were amused when I told them both that we’re having dinner with the Siggelkows – wondering who’s the lucky 100th! Such a blessing – wonderful sites, new sightings, bit of underwater clean up, safe dive plus a free sumptuous dinner – the Lord is good. And Angel was saying he was pining for grilled back ribs which exactly what we had! Simple wishes – simply answered with no cost….. It was raining the following morning but has to go downtown for the mass (it was Sunday), and I don’t need to complain about the rain and it’s not a reason to skip the mass. I had no time to have it in Cebu, more so in Cagayan de Oro as it would be too late when I get home. It started already when we got to the church but just in time for the 1st reading. Surprisingly the rain stopped already when the mass ended. We hastily get back to the lodge – had our breakfast, brief talk and goodbyes and some photos with the Siggelkows. We promised ourselves another dive trip to explore more of Pescador Island and Airport next time, also to frolic in the serene white beaches around Moalboal. We took again the Ceres bus back to Cebu, going through the same route – I took pleasure in the churches we passed along the hi-way and of course I don’t want to miss the old acacia trees in Carcar road. It seemed like the trip was shorter going back to Cebu. 😛 We took a cab when we got out of the terminal but Angel & Mike alighted since they were going the other way. I need to go to the travel lounge to fix things – much that I wanted to visit the Sto. Nino Shrine and Redemptorist Church but don’t want to run out of time, I even failed to call my friends – Willyn & Ms. Angel. After a quick late lunch (I felt no hunger) I left for the airport for an early check in, I don’t want to be rushing again! The flight was on time and full, sitting on the plane my homework running on my mind – I have a presentation to do the next morning in the Monday mini-program! It was raining when we arrived CdO but thankful it wasn’t foggy for the landing.